Hey geeks! I was trying to create a new channel for Buffysaur and spent a good two to three hours looking for the best way to do it. You see, I already have a personal YouTube channel tied to my account but I wanted to create new or additional branded channels to separate my different blogs. Trying to poke my way around YouTube, creating additional channels is not a walk in the park so I thought if I was having a hard time, there must be a lot of other users out there struggling with the same issue! So, like what any Geekysaur would do, I persevered! Turns out half the battle is knowing where to click. Follow the instructions below to have your own additional or branded channel in no time! Login if you haven’t already then click on your profile on the upper right. Afterwards, click on YouTube Settings. You should be taken to your Account Overview page. From here, click on See all my channels or create a new channel. You will then be shown a list of your current channels and the option to create a new channel. 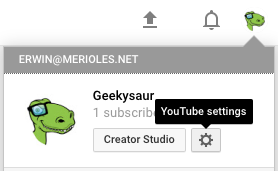 Now, click on the [ + Create a new channel ] button. The next page would allow you to define your channel name and proceed to creating a channel. Just put your desired channel name on the textbox then click on the [ Create ] button. That’s all there is! Your brand spanking new channel has just been created. To switch between your channels, just click on your profile on the upper right and you will see a list of your channels! Easy enough right! I’ve actually hit myself on the head several times for not figuring it out sooner but don’t worry, with this guide, just follow the step-by-step and you’d be up and running before you could even say supercalifragilisticexpialidocious! Did this help you? Do you know of another way to create additional or branded channels? We’d love to hear from you so hit us up in the comments section below. Don’t forget to share as well if you know someone who needs to create their own channel and might benefit from this post!